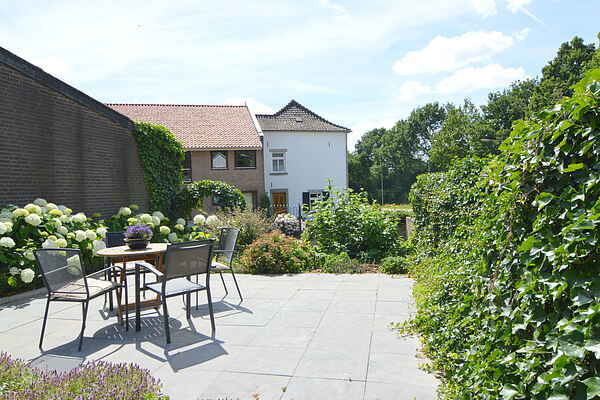 This wonderful, historic farmhouse complex is located on the boundary between the village of Klimmen and the charming town of Valkenburg. This 110 m2 holiday apartment is situated on the first floor in a section of the farmhouse. The apartment is very fully furnished in a high-quality design. On the ground floor you will find a wonderful enclosed garden and terrace for your use. The farm on which you are staying is a dairy farm, so you can take a peek at the cows if you would like. Homegrown produce is also sold here, such as potatoes. The hilly countryside of South Limburg is perfect terrain for cyclists and motorcycle riders. No wonder the Netherlands' famous bike races are held here. If you would like to explore these paths for yourself, such as the Mergelland Route, which passes right by the front door, then you can rent a bicycle here. If you bring your own bicycle or motorcycle with you then you can safely store it here. The town of Valkenburg is just 2.5 km away and is a popular destination thanks to its many outdoor cafes, the Thermae 2000, the De Valkenier amusement park and the limestone mines, where unique Christmas markets are held each year. If you fancy even more entertainment, the cities of Maastricht and Aachen are well worth a visit. hint: bring along old shoes or boots.